Susan Elias of Methuen received the Northern Essex Community College Presidential Purchase Award for her untitled collage currently on display in NECC Student Art Show. An untitled collage by Susan Elias of Methuen received the Presidential Purchase Award during the opening reception of Northern Essex Community College’s Annual Student Art Show on display through Thursday, May 16, in the Linda Hummel-Shea ArtSpace in the Harold Bentley Library on the Haverhill campus, 100 Elliott St. 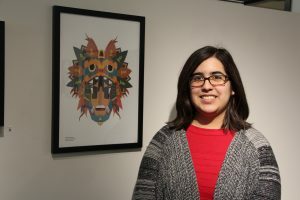 The collage, from her Two-Dimensional Foundations Class, was selected from more than 30 pieces of art created by students enrolled in art courses at NECC. The show was judged by NECC Art Faculty, Department Chair, Michelle Carter, Professor Marc Mannheimer and Professor Dianne Pappas. Each semester Northern Essex art & design faculty select works from their classes that they would like to submit for the jurying. The jurors chose the works they felt were the strongest examples from all of the works submitted. These included two- and three- dimensional fine art, graphic design, photography, film/video, and interactive media. The jurors then chose the President’s Purchase Award and three honorable mentions. Carol Cruz Rossill of North Andover received one of three honorable mentions for her “Mirror Drawing”. NECC President Lane Glenn, presented the winners with their awards telling the dozens who had gathered that he was grateful to the artists for expressing themselves. “I marvel at the talent you all have,” he said. In addition to the Presidential Purchase Award, honorable mentions were awarded to Carol Cruz Rossill, of North Andover, for “Mirror Drawing” created for a computer graphics class; a charcoal titled “Drapery Study,” by Abigail Hadley of North Reading, for a Drawing 1 course; and a cardboard and photographic transparency piece titled “Behind the Photo,” by Amber Diprima of Windham, NH, for her 3D Foundations class. 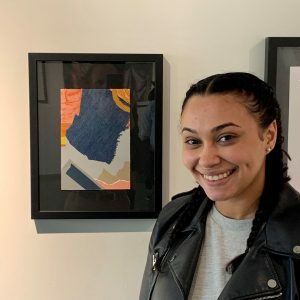 This year’s show features drawings, paintings, graphic design, photographs, video, illustrations, and three-dimensional work from students in a range of classes in the Art & Design program. Northern Essex Department of Art & Design offers many courses in fine art and design leading to an Associate Degree in General Studies: Art & Design. Gallery hours are Monday through Thursday 8 a.m. to 9 p.m. and Friday, 8 a.m. to 4 p.m.